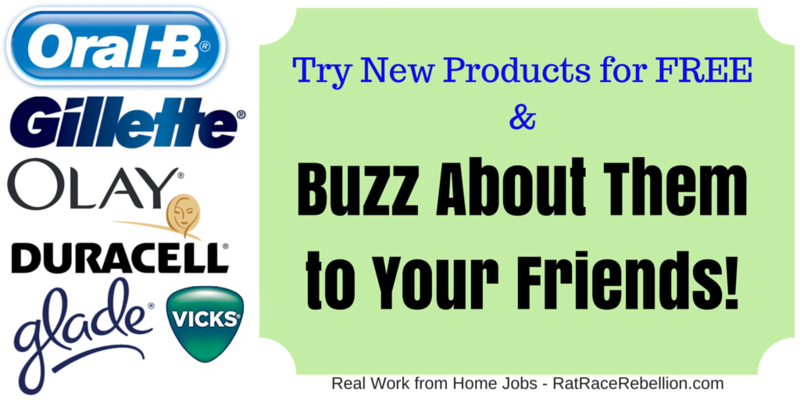 Note: BzzAgent is a FREE way to get FREE products so this post is not about making money, it’s about saving money (and being the first to try cool new products)! I joined BzzAgent years ago and I have had an opportunity to try dozens of products – all of which I get to keep. My favorite to date is my Philips Sonicare electric toothbrush (the one that sells for $170+ in stores), but I’ve also had a chance to try frozen meals (they arrive cold-packed with dry ice), snack foods, books, makeup items and more. Getting a package in the mail with the latest “goodie” to try out is just… well… exciting! Some things you just never outgrow I guess. Not to name drop, but recent trial product campaigns include L’Oreal Paris Revitalift Bright Reveal, Vicks® Sinex™ Severe Ultra Fine Mist, Glade® PlugIns® Scented Oil, Duracell® Quantum Batteries, Gillette Venus & Olay, Meta® Daily Heart Health Supplements, Oral-B Pro 3000 SmartSeries With Bluetooth® Technology Rechargeable Electric Toothbrush Powered by Braun, and many others. WHY DO COMPANIES WANT YOU TO TRY THEIR PRODUCTS THROUGH BzzAgent? Well, because BzzAgent has built an international network of consumers (like you, if you join) who, after trying products, voluntarily participate in word-of-mouth campaigns. So, in a nutshell, these companies hope you’ll love their product and will talk about it on your Facebook, Twitter, and other social media accounts. Great free products for you = Great free word-of-mouth marketing (a.k.a. Buzz) for them! It’s ABSOLUTELY FREE and here’s how it works. Register/join with some general information – your email address, date of birth, user name, etc. Complete some short surveys. These are not compensated surveys, but when you complete a survey you help BzzAgent determine the best possible campaigns for you to participate in. Note: I found that the more surveys I filled out, the more products I received. When BzzAgent finds products and services that are a good fit for your profile, they’ll send you an invitation to participate in a product trial. Reply to their invitation, try the product, and share your honest opinions about them with people you know! Final note: Your activity gives you a BzzScore that is a reflection of your level of participation, including surveys, social media posts and other factors. Generally, the better your BzzScore, the better your chances of getting campaign invites. However, they do consider a few other things when selecting BzzAgents for campaigns! Click here to get started with BzAgent today! This entry was posted in Earn Extra Cash, Work at Home Jobs and tagged BzzAgent. Bookmark the permalink.